I told you how excited I was about our vintage wing chairs, that belong to my mother-in-law and were in our aunt's home (Seth's, technically... but she feels like mine). I heard Seth on the phone talking to his mom about them and he quickly walked in the other room. I asked what that was all about... He said his mom just mentioned that, like her when she was my age, I'm still defining my style.... but if we took them, regardless of if my tastes change, they need stay in the family and not end up on Craigslist. Ummmm... She's totally right. I'm a work in progress and find "shiny" things and get all engrossed in them, like these wing chairs that are completely on-trend right now. I love that she knows that about me! So just a couple of weeks or so ago, I felt like I walked down the aisle with these beautiful pieces. From death do us part they're in the family. *Gulp. * I don't do well with commitment but am so grateful to commit to these. These originally belonged to my MIL's aunt. She says as a girl they were covered in some amazing (but kinda crazy) fabric and had fringe on the back. She called them her "princess chairs" and always felt like royalty sitting in them. I love that. 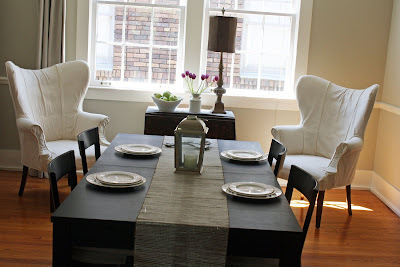 My MIL had custom slipcovers made for them awhile back in the most versatile white. Some of the underlying fabric texture shows through, but she had some great ideas for alleviating those... more on that soon. They make such a difference in the room. It's definitely a work in progress but they literally were like a dream come true. I love them and am so grateful to my MIL and Aunt. 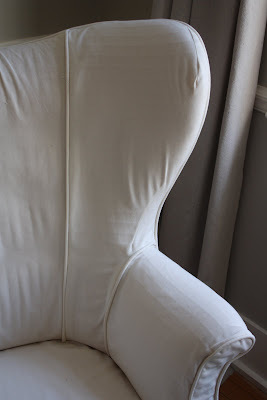 I had been stalking Craigslist and getting upholstery quotes for months (you may have even noticed a few of these in the Wists in my sidebar), then they offered them to us. Sorry for the crooked photo. I was on my way to the office during lunch and George was banging against my leg... no time for much else. The single curtain on the left is a work-in-progress (and another post coming soon). 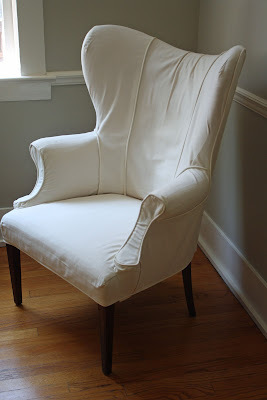 Side note: Apparently they're not called wing back chairs. Just "wing chairs". I learned from Google. Know-er of all things... or something. Any family heirlooms you've enjoyed? Do you like the wing backs?